Simply press the Panic Button in times of emergency. The button is waterproof and can be worn as a necklace or bracelet. Size – Our stylish button is the smallest button in the market place today and actually weighs less than a nickel. Waterproof – Our button is completely waterproof made to be worn in the tub or shower. Options – Our members have a choice of wearing the button as a necklace or a wrist attachment. The Base Unit immediately calls our Response Center, and seconds later an attendant will begin speaking with you. Design – The state of the art design is sleek and attractive to fit anywhere in your home. Made in the USA – We are the only American company that manufactures and monitors our own equipment. VoIP, cable and magic jack phone systems. days to notify us everything is working properly. Also, if the unit loses phone connection our monitoring center will be notified. Battery Monitoring – The advanced and cellular units have a 90 hour backup battery system in the event a home loses power. communicate with a senior anywhere in a home smaller than 3000sq feet. The Response Center will summon help by contacting family, friends, and/or emergency services. 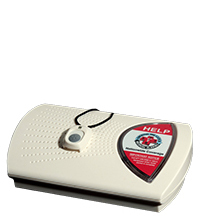 life threatening emergencies and provide lifesaving advice when necessary. Resolution – The attendants in our monitoring center will stay on the line with the member until help walks through the door. Most companies disconnect after help has been called.